The Mini came up in the 60’s in Britain, given the need to create a low-cost car, driven by the fuel shortage in the islands as a result of the crisis of Suarez. In these times sales of larger cars dropped and the British Motor Company manufactured this new model which became the most popular of those produced in Britain. In 2000 the owner of the Mini changed to BMW and so did the internal life of this car, which is much more than it appears, as the new BMW MINI is not technically related to the old Mini. This is because BWM decided to invest in this car due high European standards for safety and pollution. Today, the MINI is no longer a low-cost car, as it has become a sporty and spacious car with a powerful engine that also has the advantage of easy parking. The MINI thus continues to enjoy great popularity. 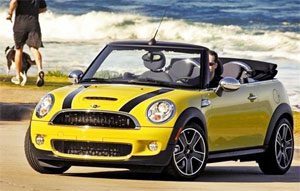 There are currently three MINI models for sale, two models MINI One Convertible and one MINI Cooper automatic. Since Malagacar.com is committed to maintaining a high standard, the company continuously renews its fleet, giving rise to very interesting second-hand offers. Take a look at these offers for second hand cars in Malaga. Bonjour je vous ecrire au mali pour les information consernand le BMW MINI combien sa coute . Please visit our car sales page. At this moment we only have Renault Megane, but we will add many more in September. Stay tuned to get the best bargains! Hi, I’m interested in buying an automatic second hand Mini Cooper. I have a budget of 8,000 euros. I live in estepona but can travel to pick up a car. Please contact me if you have anything suitable. I am interested in buying a Mini preferably Automatic can you please send details to me. Will be coming to live in Andaluca soon. Hi Naomi, I will forward your email to carsales@malagacar.com. You can also call our sales representative at +34 952 00 29 87. Thank you!